It’s hard to believe that Under Armour has only been around for 20 years, because they have already have quite the range, from clothing to equipment to footwear. 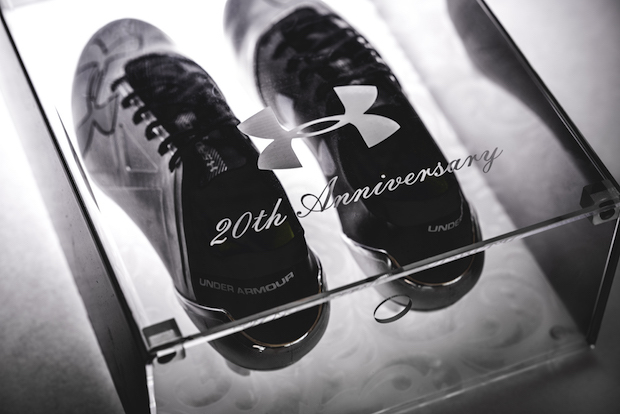 The category we would like to focus on today is the footwear section since Under Armour has been in the soccer footwear game for a few years now and has created something to commemorate the brand’s two decades. 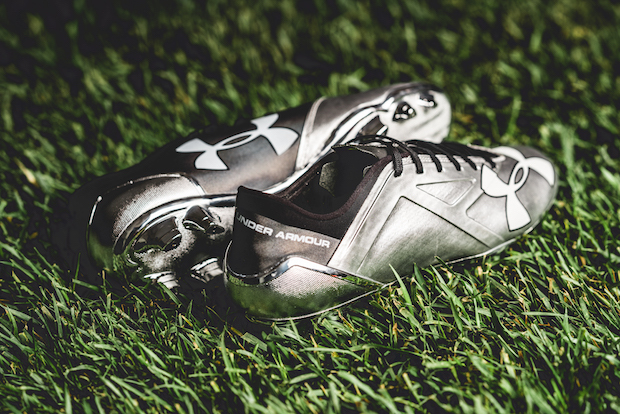 The Under Armour Spotlight and ClutchFit Force have under gone a Metallic Silver coating for a limited edition look and premium feel. Under Armour has been pushing their soccer footwear to new heights the past few seasons with the ClutchFit and Spotlight (formerly known as the Speedfrom) continually getting better, lighter, and flashier. 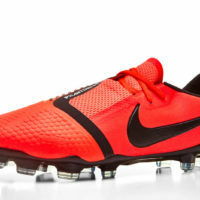 The new Metallic colorways come across as one of the most noticeable boots on the market right now. The Spotlight features a metallic upper with a black “collar”, black heel area, and a black area on the instep that features a large white UA branding. Another white UA branding is found over the toebox and it adds a little contrast to the chromed out cleats. Everything else? You guessed it, chromed out. 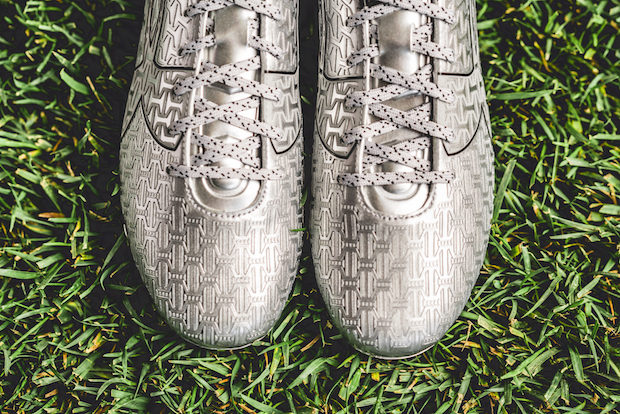 The soleplate is also Metallic Silver and is one of the cleanest looking soleplates you can find on any cleat. The ClutchFit actually takes on the Metallic Silver coloring in full force with an all Metallic Silver all over the shoe from the laces to the soleplate. The only black that is found on the shoe is found outlining the UA logo on the shoe as well as the ClutchFit branding running down the heel. If you are looking for some boots to match even the flashiest style of play, both the ClutchFit and the Spotlight Limited Edition Metallic versions are made for you. 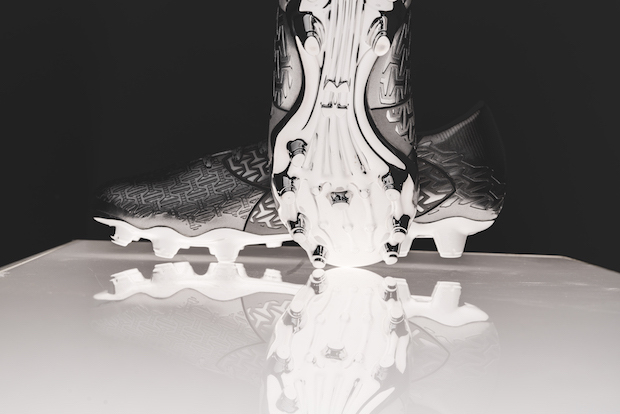 The ClutchFit Force is made for the creative players who want the maximum control cleat to take charge of the game. Granit Xhaka of Arsenal is one of the big time ClutchFit players and through his tough and relentless style of play, he fits the UA brand perfectly. The headline athlete for the Spotlight is none other than Memphis Depay of Manchester United. The man who brought the SpeedForm line to life of UA has all of the qualities to be a star winger and playmaker for many years to come. 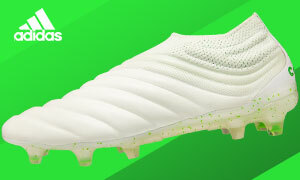 The SpotLight is made for the attacking player looking for a light weight boot that offer a little bit more protection than other speed boots.